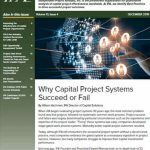 A discussion of the four key modes of project system failure, as identified by IPA’s Edward Merrow through research, and what it takes for organizations to overcome these common traps. Examining why business organizations struggle to effectively support capital projects, including five steps for planning the right structure for your project organization. In addition to receiving research on key E&P industry issues, each company attending UIBC 2018 gained valuable insight into how its capital project system performance directly compares to other members. What is driving the drop-off in cost and schedule performance in pulp and paper projects over the last decade, and what can companies do to achieve expected return on investment? IPA Celebrates 20,000 Capital Projects!